makes it easy to compare the time and cost to ride vs. fly when trains are a logical and good alternative to many flight routes in Europe. We started by adding train options for routes in Italy and Spain. Today we’re excited to announce a partnership with Deutsche Bahn in Germany to bring their expansive, fast rail service to Google Flights. This launch lets you use Google Flights to find train options for 56 destinations and nearly 400 routes across Germany and Northern Europe. Popular routes include domestic routes like Frankfurt-Munich and Hamburg-Stuttgart, as well as international routes like Zurich-Frankfurt and Frankfurt-Amsterdam. "The Google Flights partnership specifically helps us reach international travelers. For many German and European routes, trains are an attractive alternative to flights. 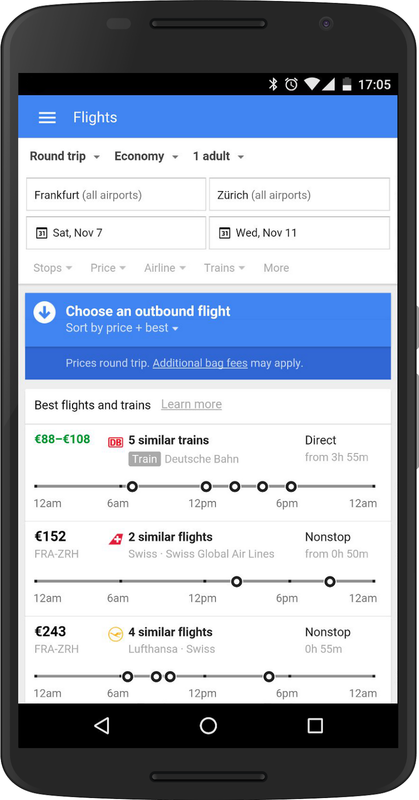 Deutsche Bahn´s integration into Google Flights is another step in our partnership with Google already providing train routes and itineraries for Google Maps,” said Mathias Hüske, Head of eCommerce at DB Vertrieb GmbH - Deutsche Bahn AG. Google Flights also makes it easier to sift through long lists of similar trains. In the same way we group similar flights, trains are grouped together — with departure times displayed across a one-day timeline. “On many routes the convenience of a train connection from city center to city center can offset travel times to and from the airport. We’re excited to bring European travelers even more options with expansive trains data from Deutsche Bahn,” said Noam Ben-Haim, Senior Product Manager, Travel. Whether you’re shopping on a mobile device or desktop, Google Flights makes it easy to scan available trains and flights — to quickly determine which is best for you. Give it a try on your next European trip. Every year, billions of people travel across Europe for personal and professional reasons — often choosing high-speed rail as a convenient option. 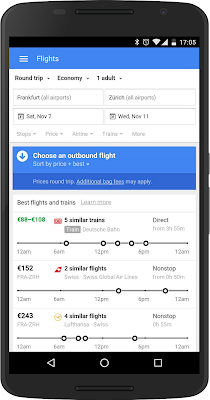 Now Google Flights makes it easy to compare the time and cost to ride vs. fly when trains are a logical and good alternative to many flight routes in Europe.